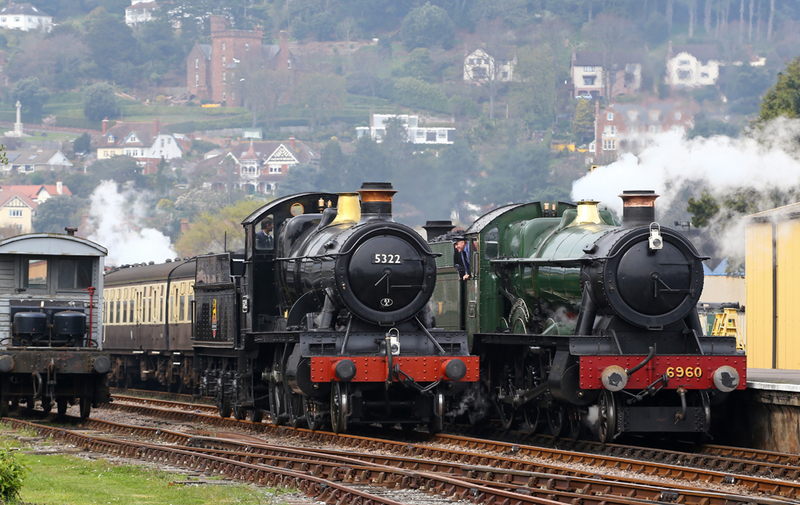 The West Somerset Railway Spring Steam Gala was in full swing over between the 28th - 30th March 2014. 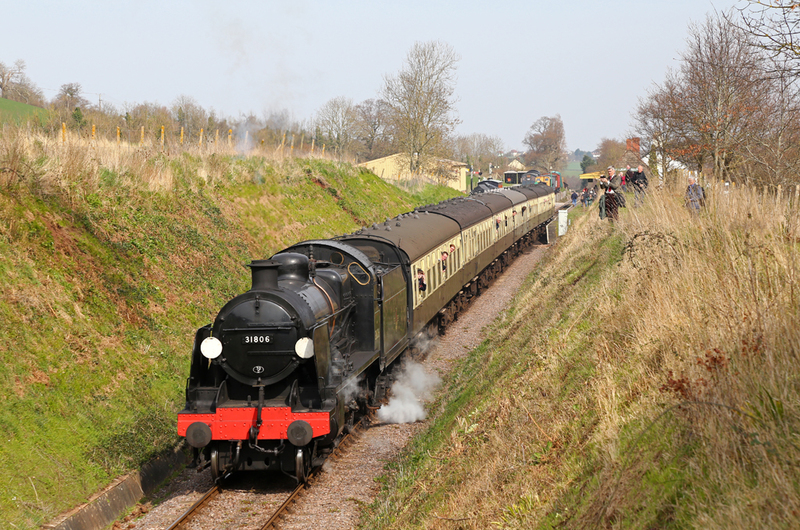 The line entertained crowds with visiting locomotives from Didcot Railway Centre, The Mid Hants Railing and Swanage Railway. The event was Southern Themed 'Withered Arm' Gala. 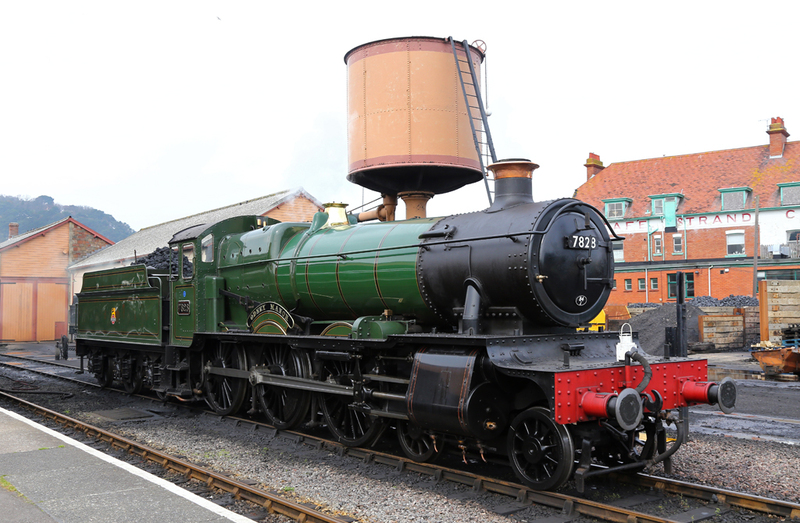 Sadly No.34070 'Manston' from the Swanage Railway failed on Friday 28th and had to be retired from the gala. 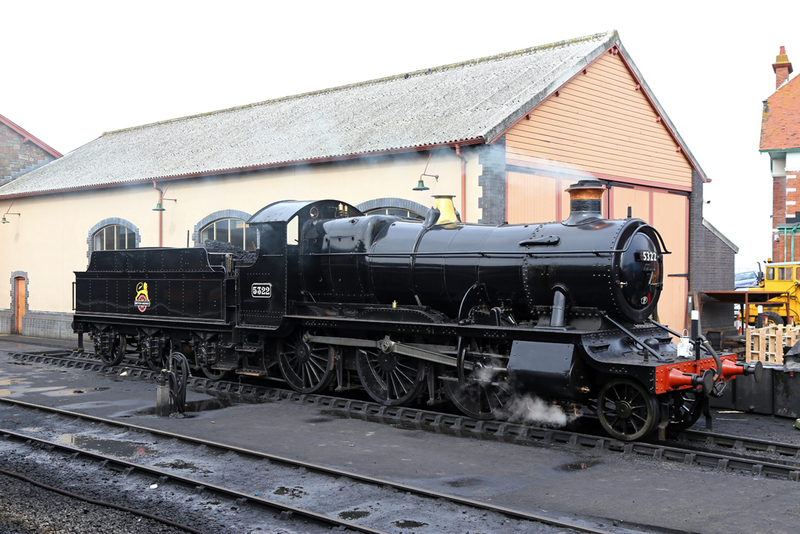 Visiting BR Mogul No.5322 was a surprise workhorse of the event, sounding superb as it worked hard to haul trains between Minehead and Bishops Lydeard. 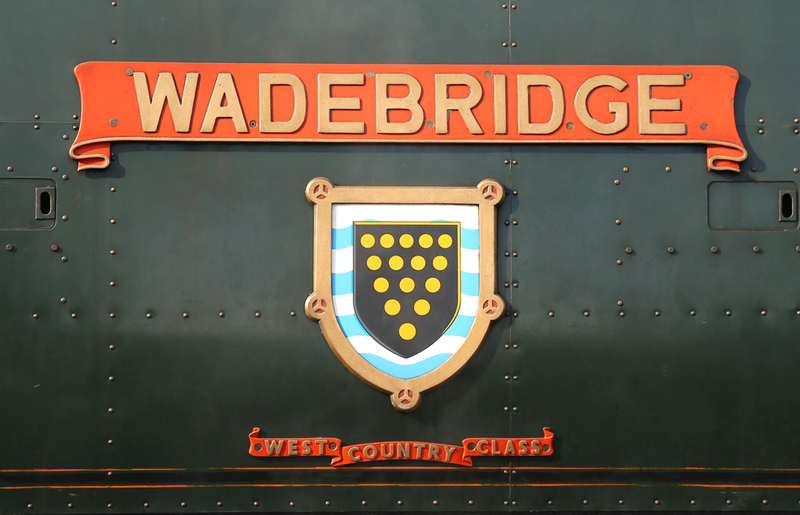 The loco also carries the 83A 'Newton Abbot' shed plate on the smoke box door. The class were a common sight in the South West on local duties with many out based from Taunton. Weather during the Saturday of the event was somewhat indifferent, however occasional glimpses of sun did break through, although it was still very cold with a large amounts of haze. 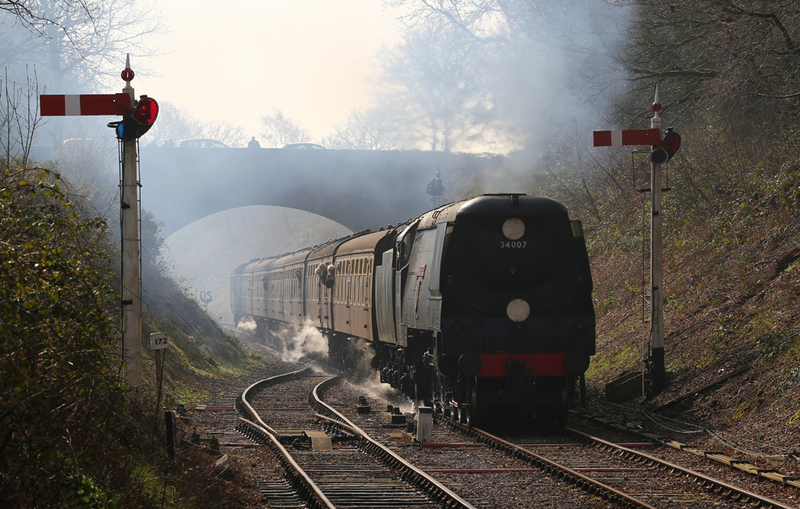 In the early morning haze the first train of the day is seen arriving into Crowcombe Heathfield Station. SR Westcountry No.34007 'Wadebridge' makes a smoky arrival climbing the last part of the bank into the station area while hauling the 09:00 from Bishops Lydeard to Minehead. SR Westcountry No.34007 'Wadebridge' rounds the curve at Hellwel Bay, Watchet hauling the 09:00 from Bishops Lydeard to Minehead. 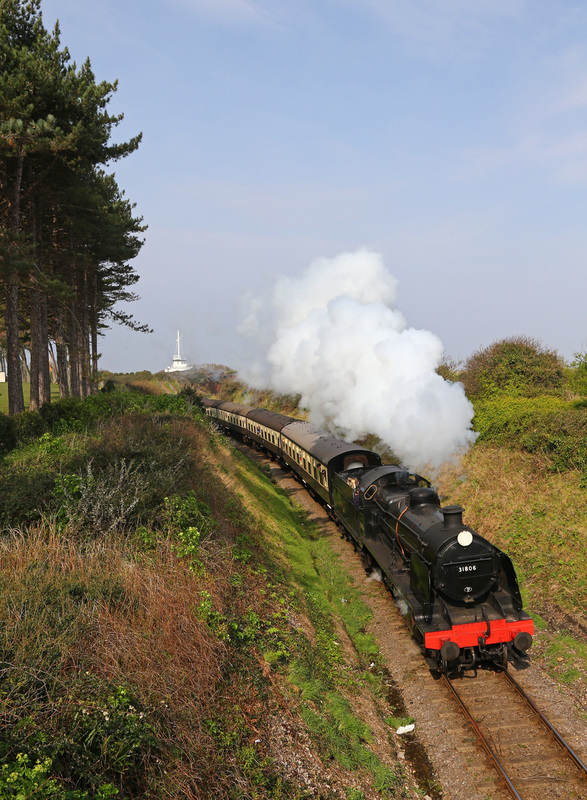 Visiting SR Mogul 'U' Class No.31806 from the Mid Hants Railway rounds the curve at Hellwel Bay, Watchet hauling the 09:45 from Minehead during a brief glimpse of morning sunshine. 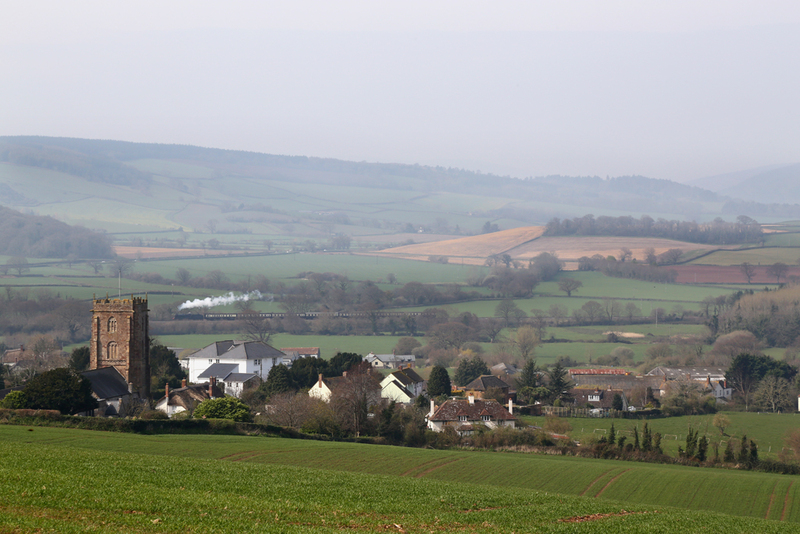 The haze was so thick that Wales was not visible from the Somerset Coastline for the entire day! 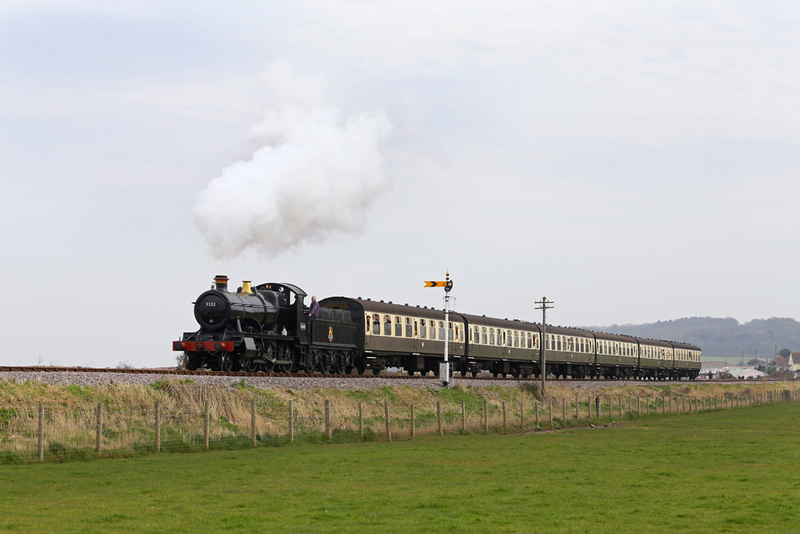 SDRJ 7F No.88 steams up Washford Bank passing Old Cleeve with the 10:45 Minehead to Bishops Lydeard service. 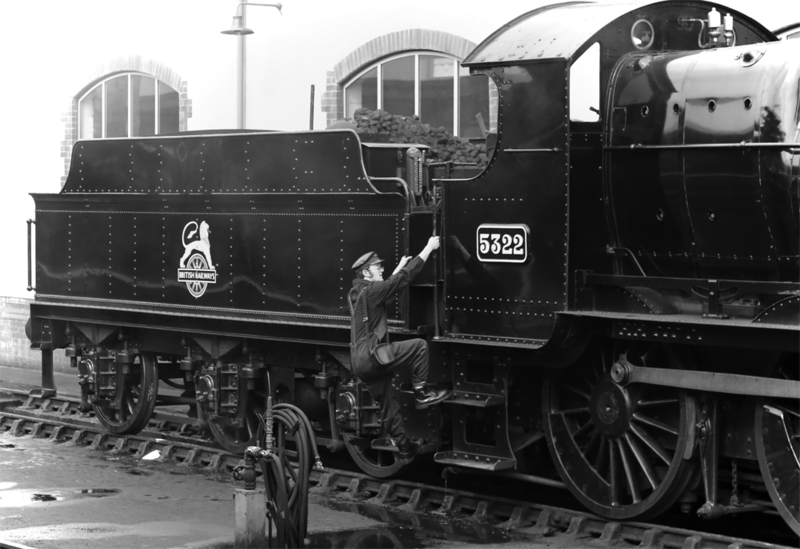 No.88 was drafted in to cover the diagrams of No.30070 'Manston' after it failed on the Friday of the gala weekend. BR Mogul No.5322 (visiting from the Didcot Railway Centre) was star of the show, the medium sized engine was working hard to haul it's six coach trains. 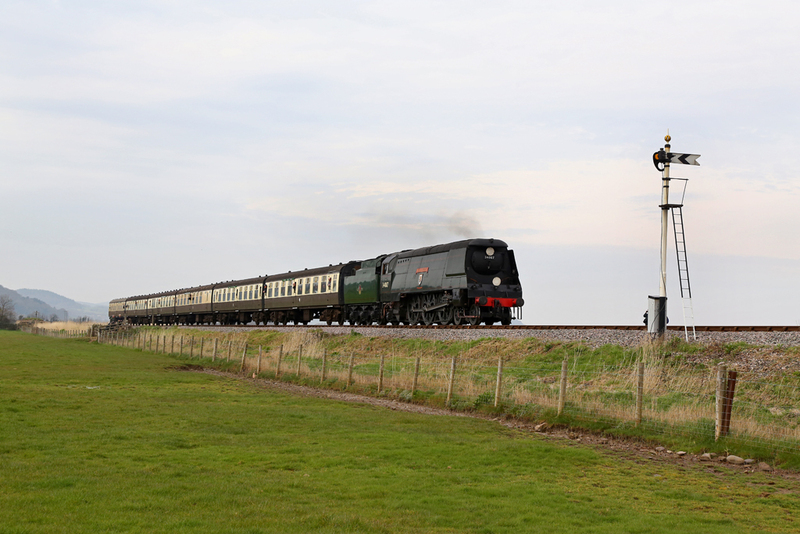 It's seen departing from Blue Anchor with the 10:45 from Bishops Lydeard. 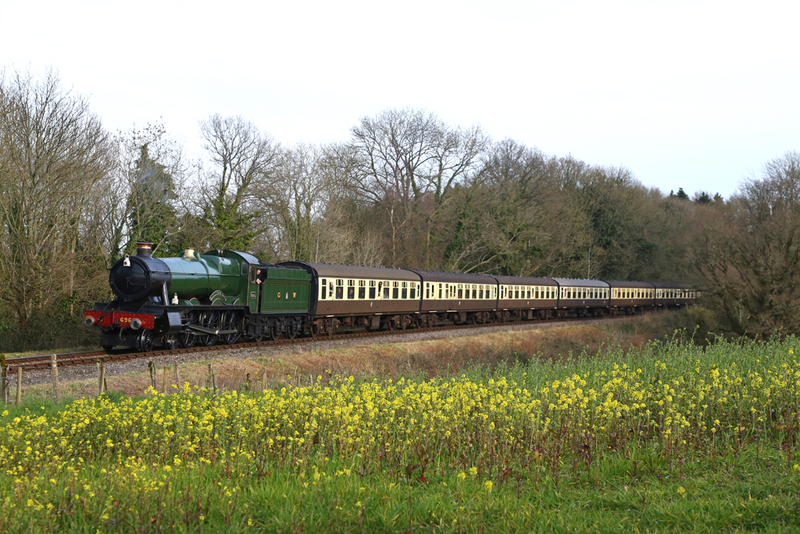 GWR Hall No.6960 Raveningham Hall & 2-8-0 No.3850 depart from Minehead with the 12:45 to Bishops Lydeard, this was the only double headed formation on the Saturday of the Spring Gala weekend. 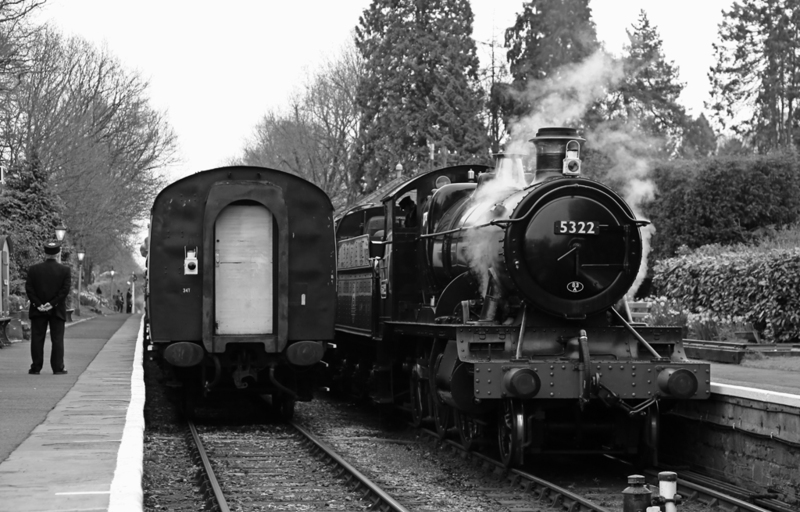 Adjacent was BR Mogul No.5322 which had arrived with the previous service from Bishops Lydeard. Various shots 'on shed' were possible at Minehead throughout the day as locos arrived for servicing and to take on water. 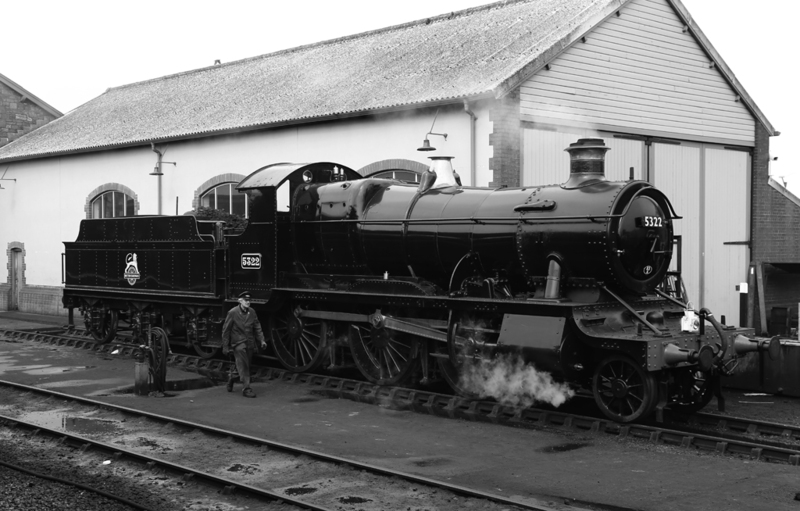 At the time of our visit GWR Manor 4-6-0 No.7828 'Odney Manor' and 2-6-0 No.5322 are pictured on shed at Minehead. 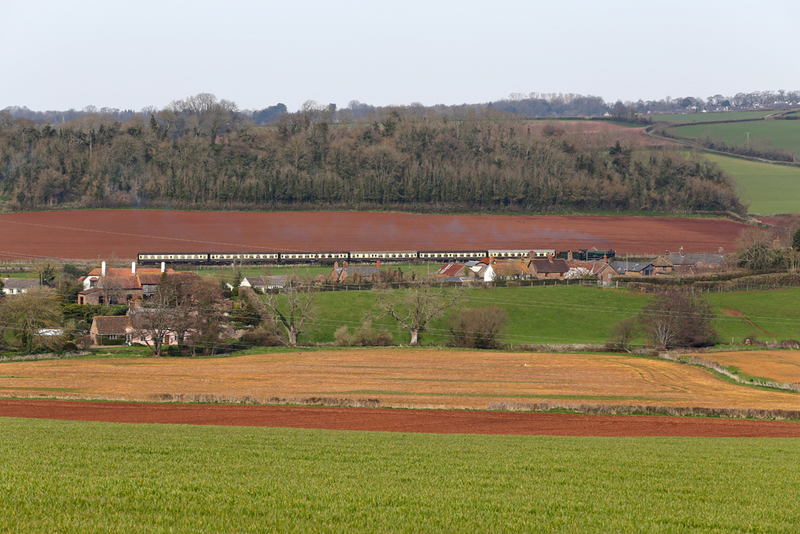 SR 'U' Class No.31806 departs from Washford with the late running 13:03 from Bishops Lydeard to Minehead during a brief glimpse of sun in the afternoon. SR Westcountry No.34007 'Wadebridge' passes the field of newborn lambs at Woolsten Moor hauling the 13:50 from Bishops Lydeard to Minehead service, note the miss-match of green between the locomotive body and tender. 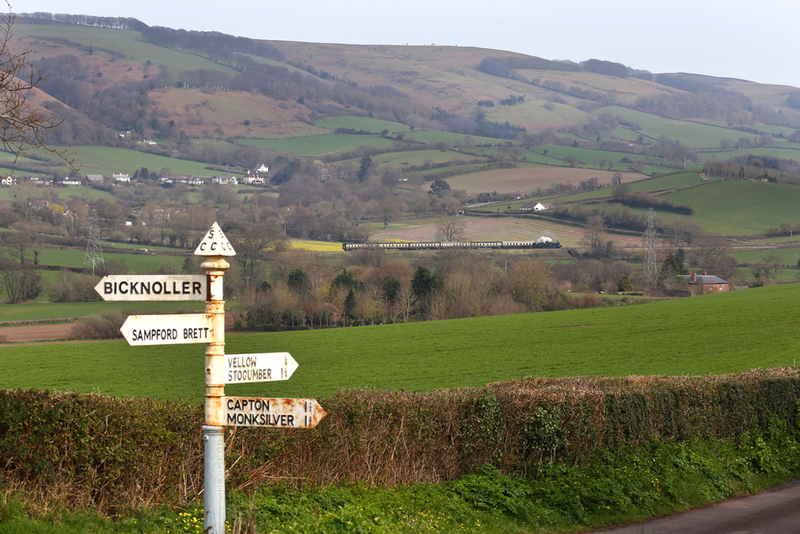 GWR Manor No.7828 'Odney Manor' climbs through Woolsten Moor hauling the 13:45 from Minehead to Bishops Lydeard. 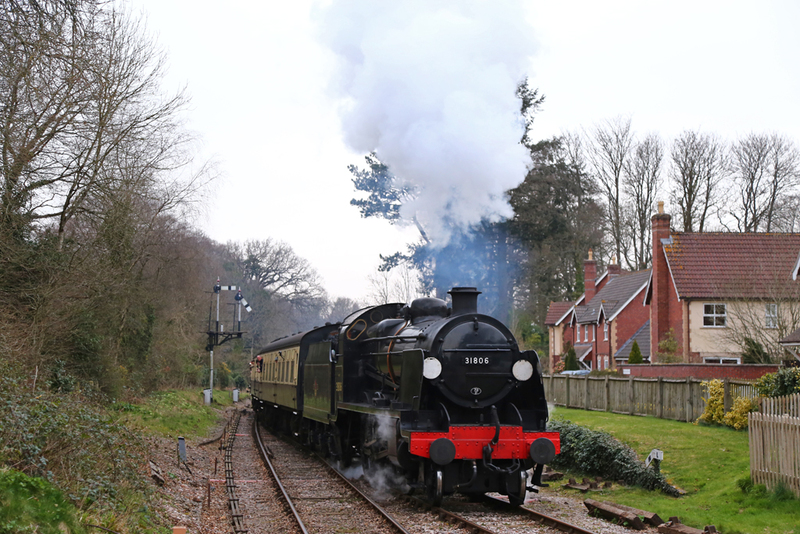 BR Mogul 2-6-0 No.5322 climbs through Leigh Woods at Roebuck Crossing, hauling the 14:35 from Minehead to Bishops Lydeard with driver Alan Dorrington on the footplate, the loco sounded superb working its six coach train through the wooded section of the line. 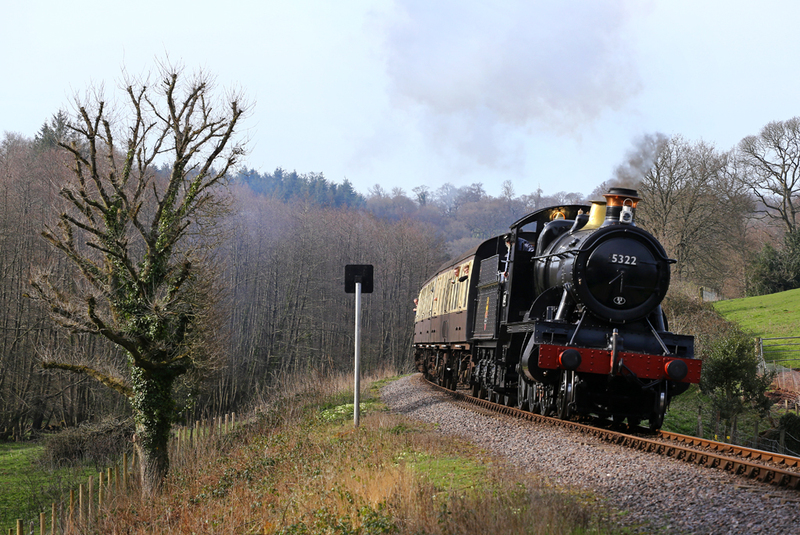 GWR Hall 4-6-0 No.6960 Raveningham Hall makes exceptionally light work of Crowcombe Bank passing Norvis Bridge with the 16:45 from Bishops Lydeard to Minehead. SR 'U' No.31806 arrives into Crowcombe Heathfield Station hauling the penultimate train of the day from Minehead, the 16:45 Minehead - Bishops Lydeard service.